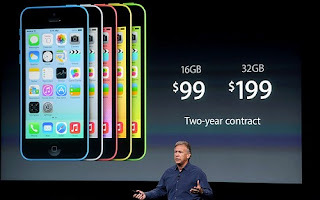 Apple has finally unveiled the much talked about low cost iPhone. Called the iPhone 5C, the new smart phone will enable iPhone compete better in emerging markets. The company also announced her new flagship, the iPhone 5S, which among other things features a built-in fingerprint scanner for unlocking phone and authenticating apps purchases. Since Apple built the first iPhone they have maintained yearly launch of one flagship smartphone. This year, Apple decided to launch two. The iPhone 5S, is the flagship with all the bells and whistles, while the other, iPhone 5C is a low cost model for consumers who may find the iPhone 5S too expensive. iPhone 5C is part of Apple's strategy to compete better in emerging markets and stem further market share erosion to Android and possibly the Windows Phone. As part of the strategy, Apple is discontinuing last year's flagship, the iPhone 5 and betting on the all new, mostly plastic, but cheaper iPhone 5C. iPhone 5C is more or less like the iPhone 5 in a polycarbonate plastic shell with a steel frame. It features the same 4.0-inch Retina display and is available in white, pink, yellow, blue, and green colours with built-in storage of 16GB or 32GB and price starting at $99 on two-year contract or 469 GBP (around 110,000 Naira which is not cheap or low cost by Nigeria standards) for unlocked models. iPhone 5S is the new flagship, built on top-grade aluminium available in three colours slate, silver, and gold. Its most talked about feature is the Touch ID, which is a built-in fingerprint scanner on the home button that helps consumers better secure their iPhone. Users will simply touch the 'home' button to unlock their phone. Touch ID will also make buying apps easier. As for performance , the iPhone 5S will not be found wanting with Apple claiming the new device is twice as fast as the iPhone 5 with graphics 5 times faster. It is also the first phone to spot a 64-bit A7 chip. iPhone 5S price starts at $199 on two-year contract or 549 GBP (around 132,000 Naira) for unlocked models. Both iPhone 5S and iPhone 5C can be pre-ordered in the United States from September 13, 2013 and will go on sale on September 20, 2013. Both phones will ship with iOS 7.